In Angkor Wat, Part One, we dared to approach the divine world that Angkor’s king created. We’ll proceed, if we can survive the heat, busloads of tourists, and mysterious powers. 1. Angkor Wat was made for regal processions. The anticipation builds as you walk on the causeway towards the center. The hot sun makes it seem that the energies that the universe came from are concentrated there. 2. 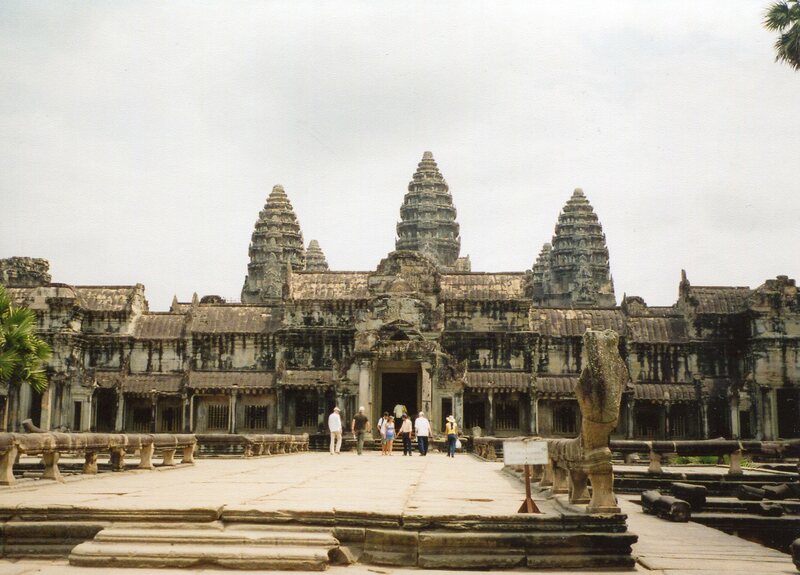 Eleanor Mannikka, in Angkor Wat, Time, Space, and Kingship, claimed that Angkor Wat is full of measurements that were associated with Indian ideas of gods and astronomy. She found the numbers 28, 32, 45 and 108 thoughout the temple. 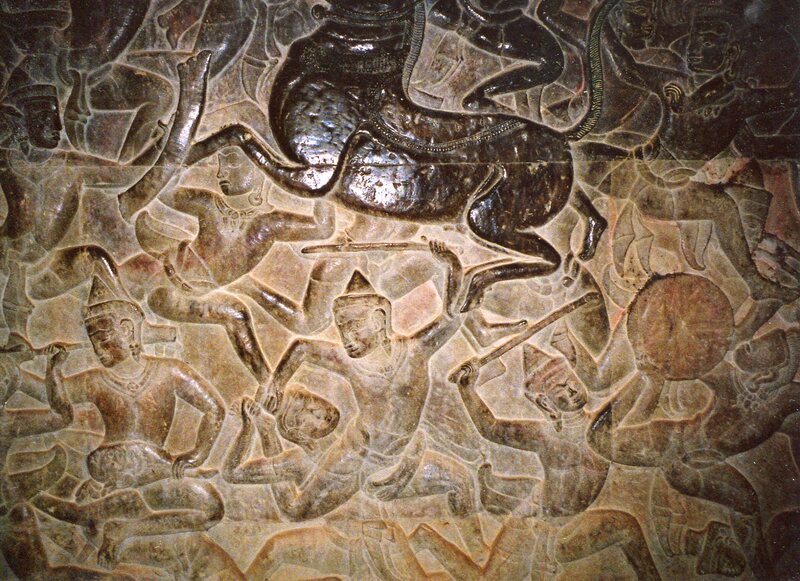 Angkor Wat might have been a map of the universe according to Hindu mythology. 3. 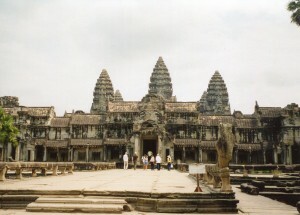 Mannikka says that different sections of Angkor Wat represent the four temporal periods according to Indian cosmology. You approach the beginning of creation as you walk towards the center. Some of Mannikka’s ideas are controversial though. If you have a mahayuga of time, you can measure the whole complex yourself. 4. There’s a building on each side of the causeway called a library. More of their space was probably dedicated to ritual objects (vestments and statues) than scriptures. An army of priests worked at Angkor Wat, and they probably stored their business tools in these structures. 5. Stone carvings surround the first enclosure. They extend more than half a mile around the center. Most are from Indian mythology. 6. The Angkor Wat style of sculpture is known for aloofness. It was carved to awe more than comfort. 7. The south wall’s west section has a frieze with an epic-scale military procession, and two images of the king. These were the first portraits of a real person in Khmer art. The king made himself about ten feet tall. The equal of the gods, or one massive male ego? 8. The south wall’s east section has a scene of souls being judged, and proceeding to paradise or hell. Most crimes that are punished are theft and disrespect for religious authorities. Adultery wasn’t punished as much. Khmers seem mostly concerned with the social order in a hierarchical society. Angkor had no independent merchant class. It didn’t use money–people bartered. Society was held together by the king’s personal relationships with nobles and elite priests. There was no abstract bureaurcracy, as there was in China. Most people were farmers, and they were required to build and maintain the enormous temples. Slavery was also common. But Angkor was full of waterways and thus cleaner and less congested than cities in Medieval Europe. Khmers also enjoyed a calendar full of festivals. 9. The east wall has a scene of mythical beings pulling a giant snake to churn the cosmic ocean for the elixir of life. This has been seen in political terms–the king’s identification with Vishnu made him pivotal in the universe’s order. Others have seen it in spiritual terms–the cycles of creation begin anew. 10. Carvings on the northeast wall were done later, in the sixteenth century. Some horses look like Chinese dragons–Chinese or Thai artisans might have worked there. 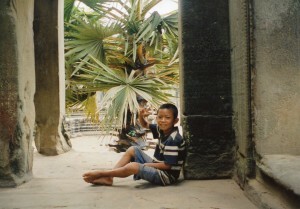 Angkor had only about ten percent of its glory-day population then, and the styles are less refined. 11. 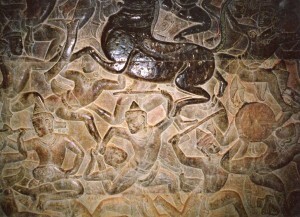 The northwest wall has one of the most violent scenes from Asian art. In this rendition of the Ramayana’s final battle, severed limbs and torsos fly in a whirl of destructive energy. 12. 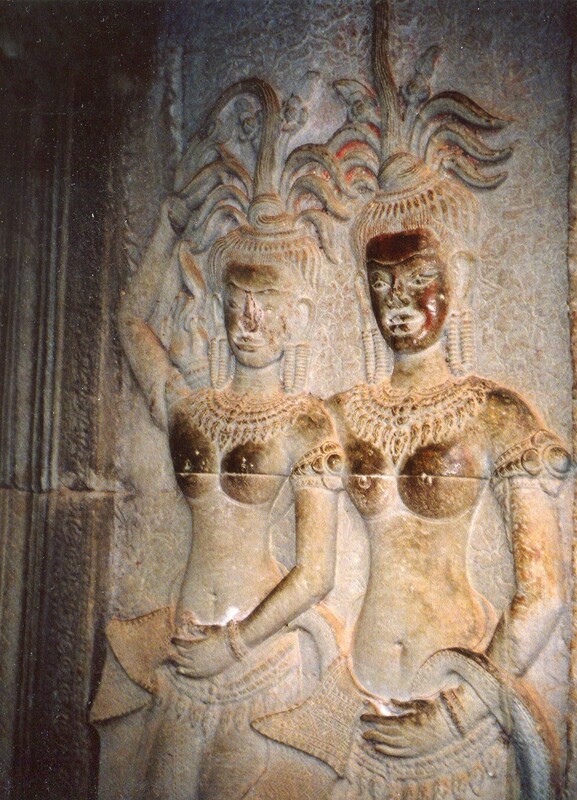 But carvings of dancing girls called apsaras balance the aloof gods and kings. They’re mythical performers for Indian gods. Over 2,000 grace the temple, and most are unique–different hairdo’s, crowns, clothing and jewelry. 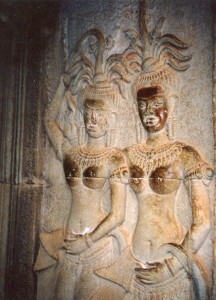 Many might have been portraits of real dancers at Angkor Wat. They have the coquettish grin of a teenager who’s just discovered that she can turn the head of every male in the room. Angkor Wat thus has many personalities, and scholars have interpreted it in different ways, according to their own mindsets. This temple is bigger than one interpretation. Tripadvisor recommends spending at least two hours there. That’s a joke. The more deeply you study the largest temple in Southeast Asia, the more wonders you’ll find. But we’ve only walked around the first enclosure. We’ll explore Angkor Wat’s deeper meanings when we proceed towards the center in the final part of this post, Angkor Wat Three.